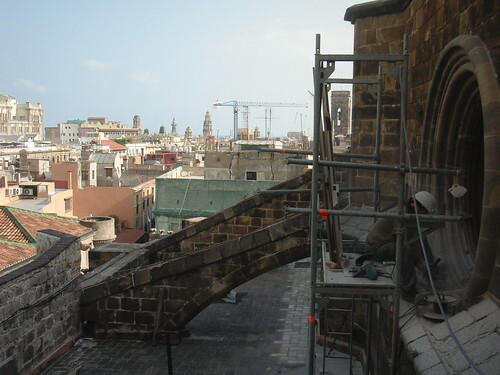 Never been on the roof of a Catholic Cathedral…until….NOW! Don’t you just admire this government official’s dedication to duty? 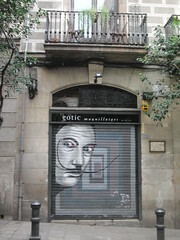 Day trip if you’re renting a car – Cadaques and Port Lligat, book well in advance to visit Salvador Dali’s house. Drive all the way up to the most Eastern point of the Iberian peninsula (Cap de Creus) and have a coffee/beer/snack at the top enjoying the amazing views. Montjuic – check out the Olympic Village during the day, pop in to Poble Espanyol, an open air museum and enjoy the distinct style of the Spanish regions. An absolute must are the ‘magic’ fountains (Thurs-Sun 2100-2330, buy some beers or cava beforehand to enjoy the show!) between the National Palace and Placa Espanya. Eating at the market. Les Cuines de Santa Caterina – this is a general google search. Looks like your Lonely Planet guide should have the details. I’ve only ever eaten at the ‘bar’, not the restaurant part. 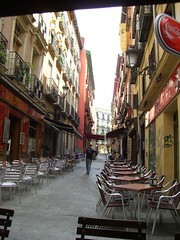 Quite a trendy place, definitely a step up from the traditional tapas bars, yet located under the market roof. If you want to experience the basic market eating check and love fresh seafood out La Paradeta located in Born. Check out opening hours if you decide to go. Things you should eat/drink: I am not talking your usual tortilla/paella stuff (btw sangria is widely regarded a tourist drink, try it if you wish but don’t be deceived – in my 4 years or so I maybe drank it….1 time with the locals). Cruasanes de crema (mini croissants with custard filling), at one of the bakeries around town. I get mine from Moli Vell, perfect with your afternoon ‘cortado’ – a popular afternoon coffee (cortado means coffee cut with milk). Pebrots de padron – one of the tapas – tiny green peppers. The fun starts when you get a spicy one!!! Read The Shadow of the Wind and visit some of the landmarks mentioned in the book. They even do the shadow of the wind tours. 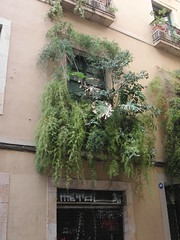 You’ll find lots of historic drinking/eating places mentioned in the book like Els Cuatre Gats (the four cats). How fabulous to be given such thorough and thoughtful advice from a friend. Excitement levels have definitely reached amber! 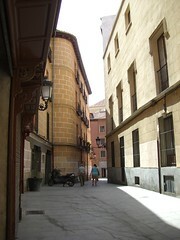 cafes to the left. cafes ahead. 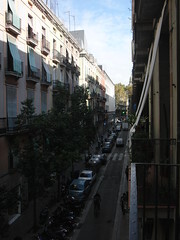 cafes to the right. 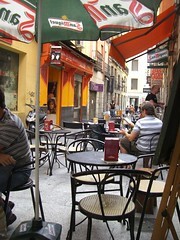 Cafes on the edge of the Lavapies district of Madrid. 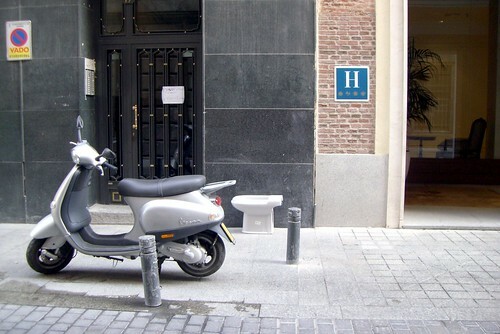 There may be a time in every bidet’s life when it waits on the street. The silver Moped appears to be gaurding the silver Bidet from random attack by a misguidedly malicious person that may well hold a grudge against bidets in general due to unfortunate accident in their formative years. Its possible. The attacker is unlikely to have been raised in the US where people are protected from high-risk, irresponsible, youthful escapades with bidets. Do you think this bidet is visiting the Hotel? 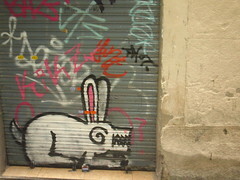 A basic coat of white covered with coloured dashes and squiggles overlayed with grafitti. The car appeared to be inviting me to get a spraycan out and add my momento to its journey. Mobile, socially accessible and constructed art. Fabulous use for a classic car of which I have very fond memories. 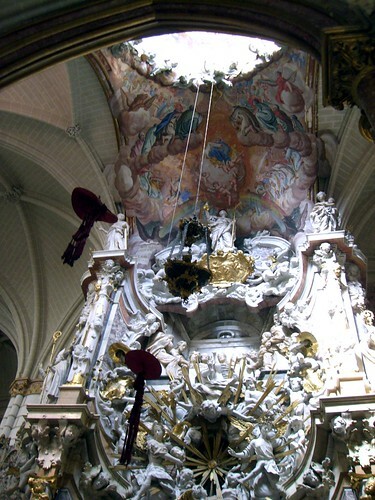 In Spains Catholic religious capital Cathedral, Toledo, the burial places of Cardinals are marked by their hats being suspecnded from the ceiling above. The hats hang until they decompose. They add an eerie feeling to the cathedral as they gently swing in the silence. 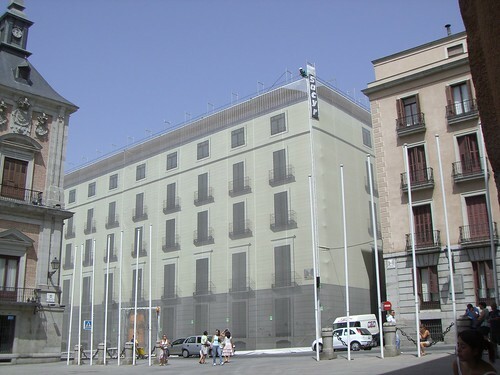 The building in the centre of this photograph is covered in cloth that is coloured to look like the outside of a building. Behind the cloth I can hear what I pressume to be hammers and drills and conversation, muffled in the distance. What a wonderful gift to the inhabitants of the city, containing the noise and dust of renovation to the building being renovated. 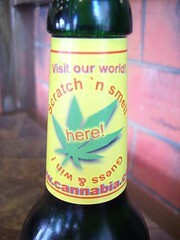 because I drank a German beer made with the finest organic hemp from a bottle with an English label in a Spanish cafe. It was all terribly civilised. Politeness and respect all around. 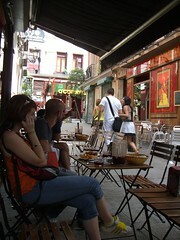 The man in this photograph was giving the lady a personal guided tour of the Latin Quarter of Madrid. In English. I followed them, at a distance, for a couple of miles hearing all sorts of lovely little details. They nearly discovered me once when they walked down a dead-end alley and turned round to come back out. Luckily I was still in Hitchcock sleuth mode and managed to scarper without being spotted or falling over any parked Mopeds. According to the guide this is the oldest door in Madrid at 500yrs old. 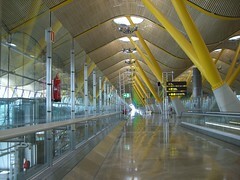 Madrid is a fairly young city by European standards. they do not drip messy wax, they do not blow-out in the gentle church breezes, securely collecting donations, equal lights for each prayer, only the bulbs need replacing and the cover eases dusting and cleaning. 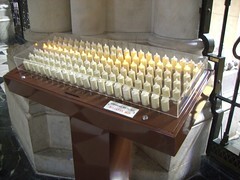 These prayer installations were in both the Cathedrals I visited in Spain. The emotional, sensual, experience of an electric prayer barely touches that of lighting, smelling, watching real candles. not the name of an English pub. 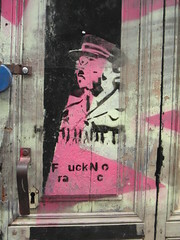 Infront of a Musical Opera shop where Nun and moped pretend that they have never met before. After taking the photo I joined the game by pretending that I was in an Alfred Hitchocock movie and followed the nun. Just incase. I think I managed to stay incognito, following from a distance, wearing dark reflective Ray Bans. 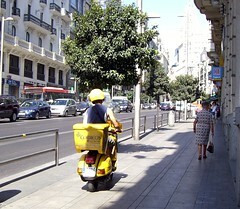 Lady in deceptively slow-moving dress caught undertaking a yellow Moped on Gran Via. Watch out for the Handbag, it’s like an air-bag only much harder on sudden contact. 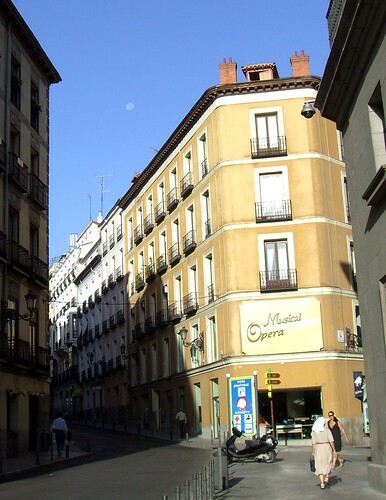 I jumped right in and fell-over on my first day in Madrid. Nice scrape there on my knee… …and what colour and style are those pants I’m wearing….a shade of khaki…a version of cargo….have I succumbed to the camoflauge of the masses? 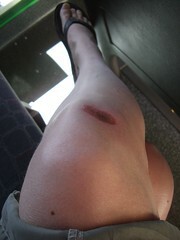 Oh fickle me and my grazed knee. The Spanish locals are wearing the pants of the cargo khaki. They are internationale. They are slightly smaller than the US equivalent. They look like they fit the wearer. 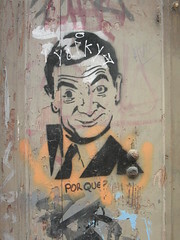 They are all over the place here in Madrid. Should I be scared or simply make sure I extend my wardrobe to contain the now essential khaki pants des cargo? forty-third in a series of posts describing the experience of taking tea, or not taking it in this case, English style. It is highly likely that I haven’t had a cup of tea for days by now because I’m on HOLIDAY in SPAIN where its probably too HOT for proper tea. When I know for sure where I am and what I’m doing and whether it involves tea or not I’ll write a comment on this post about withdrawal symptons. I can’t really be sure what’s happening because I wrote this blog entry before I left for SPAIN and used that automatic post-it widget doobry to post it now. friend: there was something else I wanted to tell you about but I’ve forgotten ….. 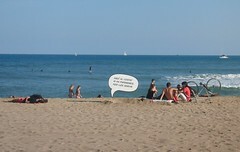 Guest entry from Barcelonean WhitePrince.